A down is a period in which a play transpires in American and Canadian football. The down is a distinguishing characteristic of the game compared to other codes of football, but is synonymous with a "tackle" in rugby league. The team in possession of the football has a limited number of downs (four downs in American football, three downs in Canadian football) to advance ten yards or more towards their opponent's goal line. If they fail to advance that far, possession of the ball is turned over to the other team. In most situations, if a team reaches their final down they will punt to their opponent, which forces them to begin their drive from further down the field; if they are in range, they might also attempt to score a field goal. A down begins with a snap or free kick (such as a kickoff or safety kick), and ends when the ball or the player in possession of it is declared down by an official, a team scores, or the ball or player in possession of it leaves the field of play. The player with possession of the ball after he has been tackled or is otherwise unable to advance the ball further on account of the play having ended (e.g., "He is down at the 34 yard line") is down. Down may also refer to the ball after it is made dead in one manner or another. The line of scrimmage for the next play will be determined by the position of the ball when it is down. Each possession begins with first down. The line to gain is marked 10 yards downfield from the start of this possession, and the situation is described as "1st and 10" (if the goal line is less than 10 yards downfield, then the goal line is the line to gain and the situation is "1st and goal"). If the offensive team moves the ball past the line to gain, they make a new first down. If they fail to do this after a specified number of downs (four in American play and three in Canadian play), the team is said to turn the ball over on downs, and possession of the ball reverts to the opposing team at the spot where the ball was downed at the end of the last down. If a penalty against the defensive team moves the ball past the line to gain, the offensive team gets a new first down. Some defensive penalties give the offense an automatic first down regardless of the distance. When the offensive team has not yet made a first down before reaching the final down, the team faces a last down situation (third down situation in Canadian play and fourth down situation in American play), where the team is forced to decide whether to either scrimmage the ball in an attempt to pick up the first down (this is called going for it [on fourth down]), or alternatively to kick the ball (either by punting or making a field goal attempt). Though statistical analysis of games suggests playing more aggressively is the better option,kicking the ball is typically seen as the safer solution; scrimmaging may lead to a turnover on downs, potentially giving the ball over to the other team with good field position. Downing the player with possession of the ball is one way to end a play (other ways include the player with the ball going out of bounds, an incomplete pass, or a score). Usually a player is made down when he is tackled by the defense. In the NFL, if the offensive player is touching the ground with some part of his body other than his hands or feet, then he is down if any defensive player touches him. In the NCAA, an offensive player touching the ground in the same manner is down, regardless of whether a defensive player touches him. If recovering the ball in one's opponent's end zone (following a kick-off in American football, and following any kick into the end zone, except for successful field goals, in Canadian football), a player may down the ball by dropping to one knee (note that in Canadian play, doing so scores a single for the opposing team). A player in possession of the ball will down the ball if he fumbles it out of bounds. If a quarterback is running with the ball during his initial possession of the same play following the snap, he may down the ball by voluntarily sliding from his feet to a sitting or recumbent position - this is to protect the quarterback from injury. In the NFL, the quarterback is the only player for whom falling down in this way automatically stops play. 1st & 10: First down with 10 yards to go for a new first down. This is the usual starting point for a possession. On occasion the yards to go may be a number other than 10, due to a penalty (moving the ball backwards or forwards, depending on whether the penalty is against the offense or the defense respectively) and replaying the down. If 1st and 10 would result in a line to gain at or beyond the goal line, that term is replaced by 1st and goal, defined further below. The referee signals a first down by facing the goal the team in possession of the ball is advancing toward and extending his forearm toward the goal with palm usually open. Sometimes a referee will mistakenly indicate a first down when the offensive team recovers its own fumble, and the recovery does not result in a first down. The proper signal would be the signal for the particular down as there is no specific sign in football to indicate a fumble recovery. 2nd & 5: Second down with 5 yards to go. Similarly, 2nd and 10, 3rd and 2, etc. If the line of scrimmage is further than 10 yards away, it may be indicated as "2nd & 11", "2nd & 15" etc. The referee signals a second down by holding up his arm and extending two fingers. 3rd & long: In American football, third down with an unspecified but significant distance to go (usually over 7 or 8 yards). Often used as a metaphor for a desperate situation that demands risky actions be taken. The corresponding Canadian football term is 2nd and long. 3rd and long is also a time that is likely to produce a pass play. 2nd and long is also sometimes used in American football when over 10 yards, as a result of a loss of yardage, such as via a quarterback sack or offensive penalty. The referee signals third down by holding up his arm and extending three fingers. 3rd & 1: Third down with one yard to go. This is often used in tense situations in Canadian football where the offense is tempted to scrimmage the ball rather than kick for a chance to get another first down. A similar term used in American football is 4th & inches. If the ball is deemed too close to visually determine whether or not a first down has been achieved, the official chain crew will be brought onto the field for a measurement. 1st & goal: First down, where the goal line is the line to gain, for example, 1st and goal on the 8 yard line. A team cannot make another first down (barring a defensive penalty) without actually scoring. Similarly, "2nd and goal", etc. down by contact: When a player with possession of the ball is made to touch the ground (other than hands or feet) by a defensive player; for example, if the ball-carrier slips and falls, he can get up and continue, but if he was pushed by a defensive player, he is said to be down by contact and the play is dead. This term is only applicable to professional football; in college and high-school football, the play ends when the player with possession goes down for any reason. The kneeling holder of a place kick attempt is not considered down even though normally a player with the ball who touches a knee to the ground is considered down. turnover on downs: Failure to make a new first down on the final (4th) down. 4th & ballgame: Informal term referring to the late-game situation where the team with the ball is losing and has reached 4th down, and failure to convert that 4th down will seal the outcome by being either the final play before the clock runs out, or a turnover would allow the winning team to run out the clock. The referee signals fourth down by raising his arm with a clenched fist. In the early 19th Century in rugby football, the ball became dead in the field of play only by mutual consent of opponents. A player carrying the ball and held by opponents would say, "Held! ", and his opponent would say, "Have it down." That is, the ballcarrier would declare himself fairly held, unable to advance, and an opponent would call on him to put the ball down, initiating the scrimmage. In modern rugby league, this is called a tackle and each team has six tackles to score; if they fail then possession changes over to the other team. The rule was established at four tackles in 1966 and was changed to six tackles in 1972. In American football, the concept of the act of having the ball down gave rise to "down" as the condition of the player so obligated, and the ball carrier could call for a "down" voluntarily. Although NCAA rules have effectively abolished this (as the ball carrier dropping to the ground immediately ends the play), other codes for North American football, such as the NFL, still allow (as one way for the ball to become dead) for the runner to cry "down". The rule is rarely used, despite having practical advantages over the preferred method of intentional downing, the kneel. Eventually the rules officially applied the word to include all of the action from the time the ball was put into play (whether by snap or free kick) until it became dead. The system of downs, in terms of a set number of plays to advance the ball a certain number of yards, were originally devised by Walter Camp and introduced to the game at the college football level in 1880, when Camp was still a player of the game. Camp's original system gave teams three downs to advance the ball five yards or else lose possession of the ball, a proposal meant to reduce sandbagging. Early in the 20th century, as the forward pass was added to the game and kicking rules became more restrictive, this was expanded to four downs, with a ten-yard requirement. The system of downs was introduced to Canadian football in 1903, where the Burnside rules imposed a ten yards in three downs requirement; those criteria remain in Canadian football to the present day. Three and out is a situation in American football in which a team, after starting an offensive possession, executes three plays and fails to get a first down, thereby in most cases forcing them to punt or, if close enough, attempt a field goal. The term comes from the standard practice that an offensive unit only has three "real" plays before they are expected to punt. While, in theory, a team is allowed a fourth play, this usually does not apply, as using the fourth down to execute a play is a risky move under most circumstances. If they fail to convert to a new first down on a fourth down play, the opposing team will be allowed to take over possession at the spot where they left off, giving them better field position than if the ball is punted farther toward the opposing team's end zone. 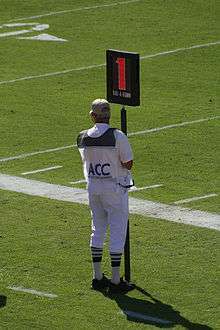 Typically, a team will only attempt a play on 4th down if they are trailing late in a close game, are close enough to the first down marker (usually a yard or less) and in the opposing team's territory, or are deep enough where a punt likely results in a touchback, but just out of field goal range. Punting following a three-and-out is unlike a turnover on downs. Punting after a three-and-out allows a team the opportunity to set their opposition farther back in field position. On a turnover on downs there is no punt, and the opposing team takes over possession of the ball at the spot of field where the 4th down attempt failed. In Canadian football, since there are three downs instead of four, the term "two and out" is used in this situation. ↑ For instance, it is often advantageous to kneel at or near the goal line in the closing minute of a game when tied or down by less than three points to run out the clock, kick a last-second field goal, and prevent the opponent from scoring. Teams with proficient offenses may allow a runner to intentionally score a touchdown in order to get the ball back and have their own opportunity to score. To combat this, a runner usually attempts to kneel at or near the goal line; however, as seen in Super Bowl XLVI, this is not always successful. Had Ahmad Bradshaw called 'down' when inside the 5-yard line, he would have not had to worry about stumbling into the end zone, as he did. Bradshaw's New York Giants eventually won the game, as they were able to successfully defend against the New England Patriots in their closing drive.